I read and reviewed this book in 2008. Sadly, it is still relevant. Happily, it is still a great read. 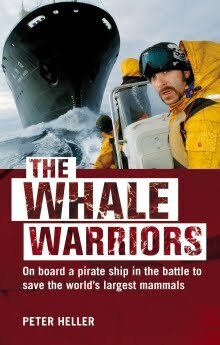 The Whale Warriors covers Sea Shepherd’s 2005-06 campaign against the Japanese whalers in the Antarctic. Peter Heller sailed on the Farley Mowat with Captain Paul Watson, as a journalist on assignment for National Geographic, and gives us an engrossing inside view of an extreme adventure. Sea Shepherd returned to the Antarctic for the 2006-07 season and are there again now, better equipped but just as radical. Violent clashes between Sea Shepherd and Japanese whalers are in the headlines again, Captain Watson is risking lives to save whales again, and Japan is calling him a pirate and terrorist again. I would like to be able to say that this book was out of date, but I would be lying. The hazardousness of the 2005-06 expedition would make for compelling reading even without the conservationist dimension. The expedition was under-funded. The Farley Mowat was an old boat, maintenance was skimped and rickety gear broke down frequently. Aside from a couple of key members, the crew were all volunteer conservationists, not sailors. Some of them brought useful skills to the trip but many, frankly, began as enthusiastic incompetents. They were tackling the wildest oceans on Earth, sailing from Melbourne to the edge of Antarctica to hunt their enemy through fog, icebergs, force 8 gales and 12-metre waves. And when they found the enemy, far bigger than themselves, they played ‘chicken’ with it: if the Japanese hadn’t blinked, the Farley Mowat would have been cut in half and the whole crew drowned. Sea Shepherd argues that the Japanese are illegally killing protected whales in a whale sanctuary in Australian territorial waters. Since international treaties, inter-governmental processes and Greenpeace’s non-violent protest haven’t stopped the whaling, Paul Watson and his crew are determined to use any means short of loss of human life to end it. Watson was one of the co-founders of Greenpeace but Greenpeace was not radical enough for him and he left to set up Sea Shepherd in 1977. He emerges in The Whale Warriors as very smart and very tough but so fanatically committed to the cause that he endangers both his allies and his opponents. The Japanese argue that their whaling is carried out purely for scientific research and the whale meat is a by-product which helps fund it. Environmentalists and the scientific community outside Japan say that Japan’s research is scientifically useless, that there is no scientific need to kill any whales, and that the programme is merely a pretext for commercial whaling. Furthermore, they say, even the commercial whaling doesn’t make sense because there is virtually no genuine demand for whale meat in Japan. Peter Heller presents all sides of the issue, through discussions on board ship and quotations from media and scientists around the world. The truth of the science seems to be all on the environmentalists’ side, but whether that justifies Sea Shepherd’s tactics is a moral question for each of us to answer. The Whale Warriors is not all controversy and nail-biting drama, though. The highly individualistic crew provides Heller with plenty of incidental humour and the Antarctic inspires some fine nature writing.